A cable tie or tie-wrap, also known as a hose tie, zap-strap, or zip tie, is a type of fastener, for holding items together, primarily electric cables or wires. Because of their low cost and ease of use, tie-wraps are ubiquitous, finding use in a wide range of other applications. Stainless steel versions, either naked or coated with a rugged plastic, cater for exterior applications and hazardous environments. The common tie-wrap, normally made of nylon, has a tape section with teeth that engage with a pawl in the head to form a ratchet so that as the free end of the tape section is pulled the tie-wrap tightens and does not come undone. Another version of the tie-wrap allows a tab to be depressed to either adjust the tension or remove the ty-wrap. The most common cable tie consists of a sturdy nylon tape with an integrated gear rack, and on one end a ratchet within a small open case. Once the pointed tip of the cable tie has been pulled through the case and past the ratchet, it is prevented from being pulled back; the resulting loop may only be pulled tighter. This allows several cables to be bound together into a cable tree. A cable tie tensioning device or tool may be used to apply a cable tie with a specific degree of tension. The tool may cut off the extra tail flush with the head in order to avoid a sharp edge which might otherwise cause injury. In order to increase resistance to ultraviolet light in outdoor applications, a specific grade of nylon containing a minimum of 2% carbon black is used to protect the polymer chains and extend the cable tie's service life. Blue cable ties are supplied to the food industry and contain a metal additive so they can be detected by industrial metal detectors. 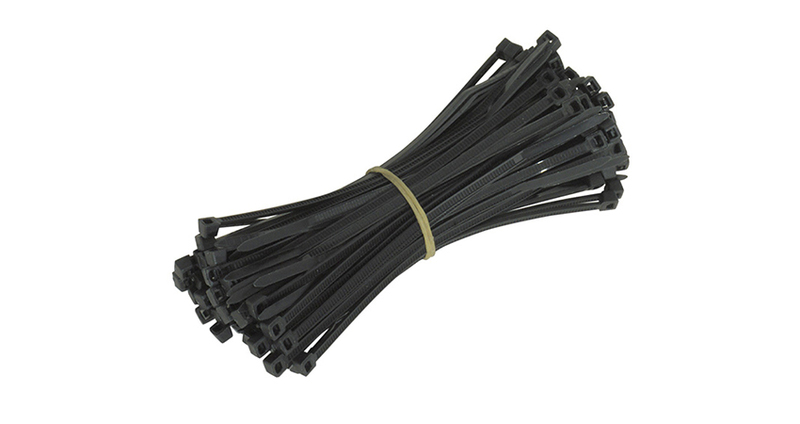 Cable ties made of ETFE (Tefzel) are used in radiation-rich environments. Red cable ties made of ECTFE (Halar) are used for plenum cabling. Stainless steel cable ties are also available for flameproof applications�coated stainless ties are available to prevent galvanic attack from dissimilar metals (e.g. zinc-coated cable tray). Cable ties can be used as makeshift handcuffs. Specially constructed physical restraints called Plasti Cuffs, based on the cable tie design, are used by police and military to restrain prisoners. Cable ties are also commonly used to prevent hubcaps (also known as wheel trims) from falling off a moving vehicle, and some are sold specifically for this purpose.